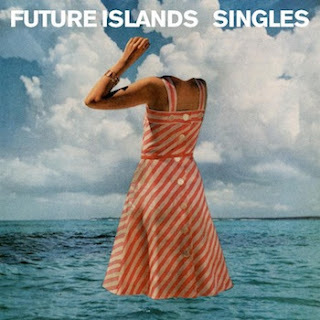 I remember seeing Future Islands perform on Letterman a couple of years back and thinking to myself, 'man, I should check these dudes out' and three years and one Men In Blazers Pod Special later, here we are, finally sitting down to check out their 2014 album, Singles. The first thing that jumps out at you about Future Islands is the music itself. It feels like synthpop, but a Wikipedia dive into the band's page reveals that prefer to consider themselves post-wave, which combines "the romanticism of new wave with the power and drive of post-punk" which actually sums up their music nicely. It feels like new wave- the lyrics are often sad and tinged with melancholy, but it's not happy boppy 80s style music either- it's got an edge and drive to it that makes it stand out immediately. They cite (again from their wiki-page) New Order, Joy Division, Kim Seal, The Cure and Smashing Pumpkins as influences, all of which I can see, but curiously absent from the list is Depeche Mode, whose new wave darkness seems like a distant cousin to what Future Islands is putting down here. But what about the album itself? Clocking in at 42 minutes, it's length feels just about perfect. There's none of the quick succession you'd expect from a punk album, but there's also none of the slow ponderous conceptual nonsense you can find on a lot of progressive rock/concept albums out there either. Would I buy this album? Now, that to me as interesting question about all of this. I think I would, but the reason I started this whole series, two blogs and seven years ago now was to explore the idea that we just don't sit down and listen to albums anymore. I think iTunes sort of broke the concept of an album, but services like Spotify are restoring it to some degree. Most of the music I review now (which again, I'm not that good at, I know) I listen to on Spotify, which I think gives you the ability to listen to one album of an artist and the freedom to explore their entire discography if you really want too.